What makes for a great screen porch design? It starts with the roof line! Notice how the architecture fits the architecture detail and color of the house and trim. Make sure the furniture that you plan on placing inside the porch will fit! Next is material usage. Utilizing materials that will hold up given the climate conditions and wear and tear makes for a good part of the design consideration. How do you best clean a tile floor in a screen porch? Most screen porches in Charlotte, NC are built with either a deck or a patio as the flooring. When the screen porch is elevated, the advantage of the deck flooring is the debris can fall in between the decking boards. We commonly get asked at Archadeck of Charlotte, what is the best way to clean a screen porch floor when there is tile? We have found the best way to clean a screen porch floor with tile is to take a broom handle with a sponge mop on the end and simply use soap and water or tile cleaner and this is the simplest and most effective way to clean it! How much does a screen porch cost? What will the roof style be (gable, shed, hip, flat)? How and where does the porch need to be tied into the house or will it be free-standing? What are the ideal dimensions or square footage that you are looking to have built? What are the materials that you are desiring to use? What finishing touches do you want (paint/stain)? What is the height from grade? If you can approximate this information, you can save a lot of time obtaining quotes! 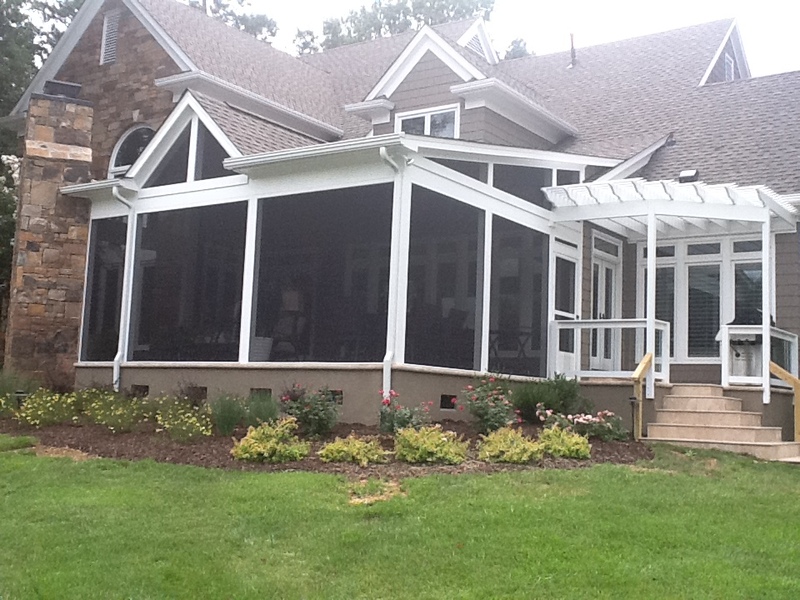 To see wonderful screen porch designs, visit our Charlotte screened porch photo gallery. What are my screen options for my porch? There are several varieties, colors, and features when it comes to screen for porches. 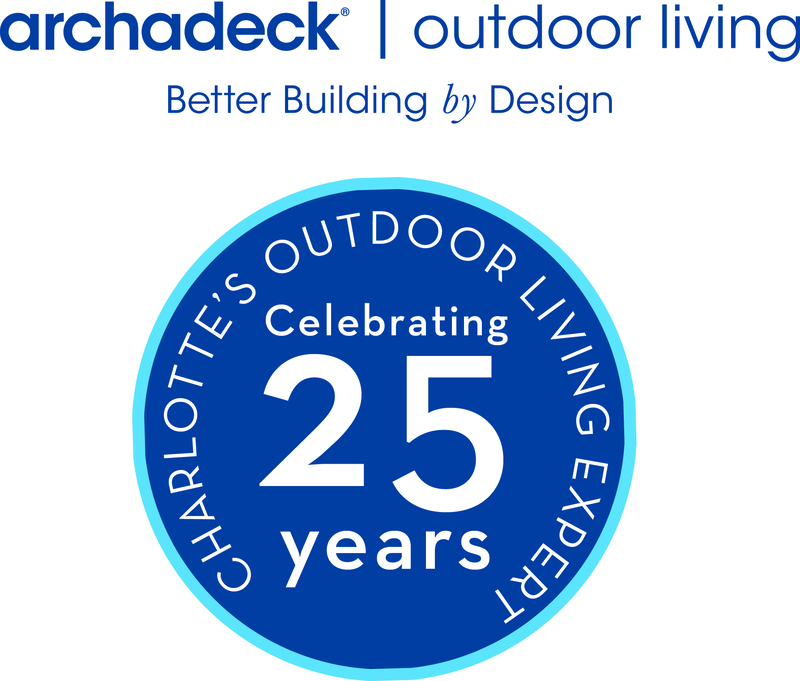 Archadeck of Charlotte is one of the largest screen porch builders in the country and never leaves the Charlotte metro area. 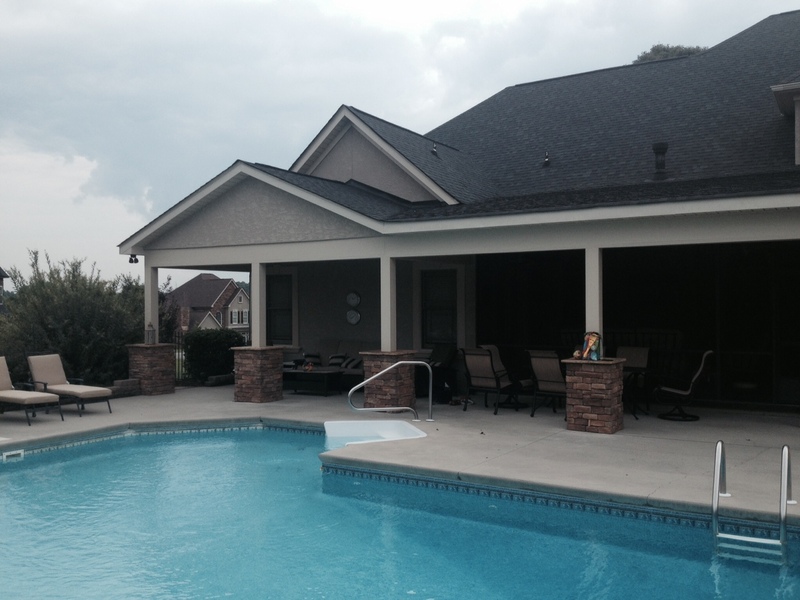 Screen porches have become favorite spots for families in suburban Charlotte and the surrounding Ft. Mill, SC market. They offer a great escape from everyday life and make you feel like you’re on vacation in your backyard. There are a wide variety of screen options. A basic option is what’s called rolled screen. This is a cost effective option that works perfectly fine. It is stretched across the outside of the porch posts and often stapled into the post. Then a trim board is attached over the screen such as a 1×4 making the fasteners disappear where the screen is attached. The photo above on the right shows a product called Screen Eze which allows for wider spans and has an aluminum frame that attached the panel to the posts. This product is great is if you want large openings! EZE Breeze windows by Archadeck of Charlotte prevents pollen from getting in your porch! Eze Breeze windows are complete units that convert your screen porch to a sunroom and right back again simply by sliding the panes up or down as shown above. They have a full screen on the outside and vinyl panels that can completely close off the room or slid to let it have a breeze. There are also vinyl framed screens that operate similarly to the Screen Eze and have a vinyl trim that attaches to the posts as opposed to aluminum. People are telling me I can’t build a roof over my Charlotte deck or patio, what can I do? Unfortunately, there is lots of advice being given on what can and can not be built by many inexperienced contractors and wanna be contractors. Most of the time, with little exception, there are ways to construct roofs over decks and patio’s even though you cannot visualize how it would tie in both aesthetically and functionally. 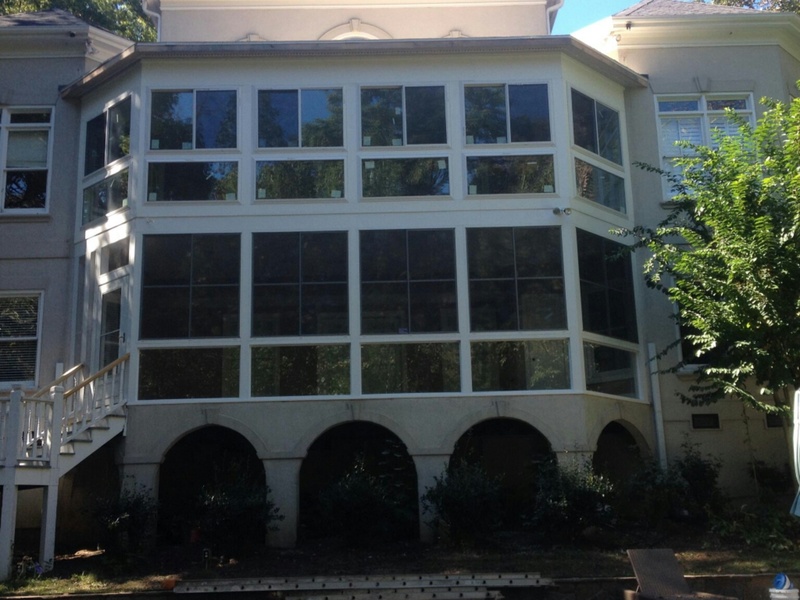 Having constructed thousands of screen porches throughout Charlotte,NC over the past 27 years, we can both show and tell you fist hand how it can be possible. Most of the obstacles can be narrowed down to windows that may be in the way of where you want to tie in the roof line or the house has different protruding roof lines that would appear to interfere with constructing an additional roof over the space. It takes some visual imagination and construction know how, but there is almost always a way to tie a roof in over a deck or patio you can block the sun and have a pretty outdoor living space. We look at the general architecture of the house to see where your windows are, what the current roof lines look like, take into account how much light might get blocked out of your house by adding a roof line, and finally any drainage issues that may occur as a result of the additional roof. Once we assess these issues, we can come up with creative and functional roof lines that make it appear the roof was there when the house was originally built, which is always the goal. I have attached a few of the projects we have built to give you some ideas of how you can cover a deck or patio that has seemingly difficult roof lines to deal with or large windows. In addition the photos, you can also visit http://www.charlotte.archadeck.com and go to the photo gallery and seek out both screen porches and covered patios to see wonderful ideas!